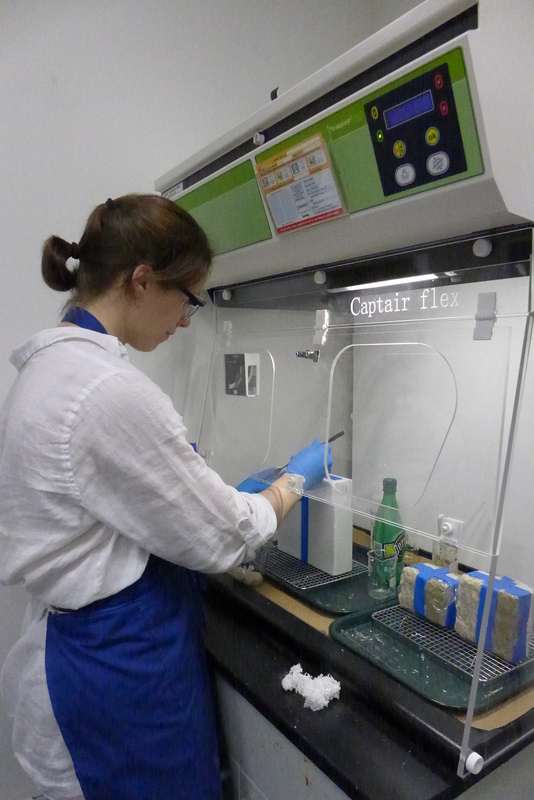 BCA in-house testing of paper pulp poultices for copper stain removal in the field. Building Conservation Associates, Inc. (BCA) is a private consulting firm established in 1985 by Columbia University Historic Preservation alum, Raymond Pepi, and has been active in the field of Heritage Conservation with three separate offices in New York, Philadelphia and Dedham, MA. During the past summer of 2013, I had the pleasure of working in their New York City office. My experience was rewarding, challenging, and well-rounded, exposing me the to various facets of a major firm, that is engaged in some of the most exciting projects I’ve encountered to date, not only regionally in the Northeast, but nationally and internationally. My internship was primarily focused on various conservation aspects of the field, but included many other forays into the inner workings of construction administration, management, and design. During my time at BCA, I oversaw their lab maintenance, familiarizing myself with the common tools, practices, products and techniques of an in-house conservation lab. I was able to research, source, and test various products for mockups and eventual use in the field. With the guidance of BCA Conservators, Erica Morasset and Marlene Goeke, I learned how to prepare paint samples for two separate projects: one involving an interesting anaglypta sample from a site here in New York; and another which comprised almost 200 separate finish samples from a building in Amsterdam. Overseen primarily by Dean Koga, Director of Technical Services, Ricardo Viera, Director of Field Services, and Chris Gembinski, Senior Associate, I had the chance to expand upon some of the knowledge gained from Columbia University’s Basic Conservation Science course, and carried out three separate mortar analyses. These were detailed projects that individually arched through days and weeks. The tasks associated with these projects included: mortar removal from the site in question; acid digestions; mortar characterization in terms of friability, cohesiveness, weathering, and soiling; Munsell Soil Color characterization of mortar, sand, and fines; assessment of sand shape, size, inclusion sorting and distribution, and sieve analyses to evaluate compliance with ASTM standards; analysis of experimental results in reference to historic mortar compositions; development of replacement sand and mortar formulae, and final reports with field specifications. In the midst of all of this action, BCA was kind enough to fund my basic scaffold training, permitting me to join on-site inspections. These visits involved sounding stone, checking patches, pins and dutchmen, and tracking these repairs through punchlist logs. From the administration, management, and design sides of the field, I dabbled with various assignments that incorporated: the review and comparison of shop drawings and contractor product submittals to initial design specifications; photographic documentation and AutoCAD drawings; and site surveys to assess any necessary changes in scope to existing projects. In summary, I could not have imagined a better opportunity to truly experience how the academic foundations established by Columbia University’s Historic Preservation curriculum are tested and built upon in the field than the one I received from BCA. A grand thank you to Raymond Pepi and Claudia Kavenagh, Director, as well as the many wonderful colleagues at BCA who guided my projects, answered my many questions, and potentially inspired my thesis topic…but that story is to be continued.